Estate clean out can be challenging and sensitive work. To give you a hand, here are tips on cleaning out an estate after a loved one has passed away. Getting started is the hardest part. Whether you’re cleaning out when someone passes away or when they move into a senior living community, it’s tempting to put off the estate cleanout work. Oftentimes, cleaning out an estate can be emotionally taxing and difficult. But it’s important to jump in and embrace this challenging moment — because there’s a lot of fun and joy that can be found in it, too. Make sure you have a cleaning philosophy before you get started. For example, what are the different ways you can dispose of items? Most people sort into keep, donate, sell and trash piles, though you may have other categories that need to be included. Know going in what you can do with things and be judicious about deciding what goes into which pile. It’s really hard to say goodbye to some things that may have meaning to you. But you must be honest when taking on an estate cleanup job. Is it really something you need? Is it something you’ll use? Is it even something you’ll ever look at again? Be honest in these moments and be mindful of the fine line between collecting meaningful things and hoarding. One great way to hang on to memories without keeping everything is to snap photographs. When you see something you remember fondly but you don’t necessarily want to store it somewhere, snap a photograph that you can keep forever. For documents, photos and similar items, consider scanning and storing them electronically. If you don’t have the right materials, you’re going to have a hard time finding success with your estate cleanout. Make sure you have plenty of boxes into which you can place items for different destinations. Put on a movie or some music or even take on cleanup work while there’s a ballgame on television. It’s a lot easier to get through if there’s some sort of distraction playing in the background. What you may not want or need anymore may be treasure to someone else. It takes a little bit of time and effort to sell items rather than trash or donate them, but it can be worth it in the end. As mentioned, estate cleanout is sensitive and often emotionally taxing. Always be kind. If you’re cleaning out an estate alongside a parent, sibling or other loved one, make sure everyone’s needs are being taken into account and that no one is being overly harsh. Yes, getting an estate cleaned out is challenging, but there are professionals who specialize in such projects and who can be an invaluable resource as you do the work. If you’re wondering how to clean out an estate, contact one of these professional services to learn about what they do, how they can help and how much they cost. You may find that professional help would be of great value to you. 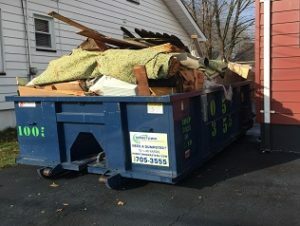 Use these estate clean out tips and get in touch with Hometown Waste & Recycling Services, Inc. if you need dumpster rental for large estate clean out jobs. We are New Jersey’s source for affordable dumpster rental.